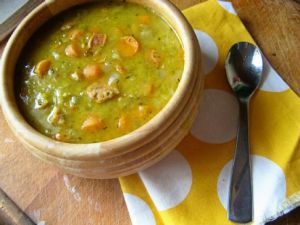 Erwtensoep met Ham | Pea Soup with Ham is a Dutch food recipe with celery root, potatoes and leeks. Cook the peas, ham bone and salt in 2 liters of water for 2 hours. Take the bone out of the pan and pick the meat off the bone. Cut all the meat in small parts. Stir the peas until they are mush and put the meat back in the pan. Mix the vegetables and sausage into the soup and cook for 45 minutes.